Timgad is a Roman-Berber town in the Aures Mountains of Algeria, about 35 km east of Batna province. The full name of the town was Colonia Marciana Ulpia Traiana Thamugadi. Thamugadi is the Berber name of the place where the city was built, which means a peak or summit. The ruins are noteworthy for representing one of the best extant examples of the grid plan as used in Roman city planning. 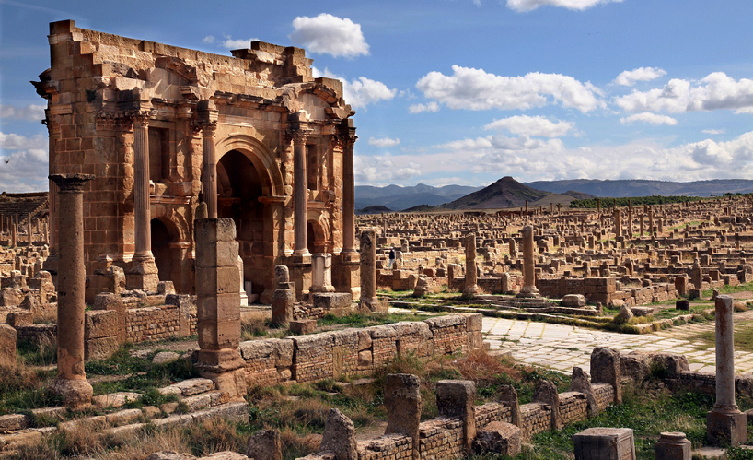 Timgad was integrated in a World Heritage Site by UNESCO in 1982 as a fantastic example of a Roman colonial town that is a regularly recommended Algerian and foreign tourist attraction. The city was founded by the Emperor Trajan around 100 AD as a military colony. It was intended to serve primarily as a bastion against the Berbers in the nearby Aures Mountains. At the time of its founding, the area surrounding the city was a fertile agricultural area, about 1000 meters above sea level. It was originally populated largely by Roman veterans of the Parthian campaigns who were granted lands in return for years of service. The city enjoyed a peaceful existence for the first several hundred years and became a center of Christian activity starting in the 3rd century. In the 5th century, the city was sacked by the Vandals before falling into decline. In 535 AD, the Byzantine general Solomon found the city empty when he came to occupy it. In the following century, the city was briefly repopulated as a primarily Christian city before being sacked by Berbers in the 5th century. Because no new settlements were founded on the site after the 7th century, the town was partially preserved under sand up to a depth of approximately one meter. The encroachment of the Sahara on the ruins was the principal reason why the town is so well preserved. The original Roman grid plan is magnificently visible in the orthogonal design, highlighted by a high triumphal arch (12 m) called the Arch of Trajan (it is also known as the Timgad Arch)which was partially restored in 1900. The arch is principally of sandstone, and is of the Corinthian order with three arches. Besides to a 3500 seat theater that stills in a good condition and is used for contemporary productions like summer parties and other festivities. The other key buildings include four thermals, basilica and the Capitoline Temple which is dedicated to Jupiter and is of approximately the same size as the Pantheon in Rome. Nearby the capitol, there is a square church with a circular apse dating from the 7th century. In the Southeast of the city, there is a large Byzantine citadel built in the later days of the city. In addition to a library which is also one of the best examples of the logistics of Roman town planning. It consists of a large semi-circular room flanked by two secondary rectangular rooms, and preceded by a U-shaped colonnaded portico surrounding three sides on an open court. The portico is flanked by two long narrow rooms on each side, and the large vaulted hall would have combined the functions of a reading room, stack room, and perhaps a lecture room, colonnaded streets and myriad temples .Timgad is the embodiment of Roman urban architecture. The discovery of the library give an impression of the grandeur of this place.It is historically important as it shows the presence of a fully developed library system in this Roman city, indicating a high standard of learning and culture.